bundled to save you money. There are several Checkmate versions, so you can work with your Checkmate rep to choose the right Checkmate for your business. This page discusses our most popular options, available with Internet Checkmate (ICM). Contact your salesperson for details and assistance. Some tools require an additional charge. Click here to compare versions. Select a topic to learn more! Checkmate Sales Pro is the completely redesigned, modern and intuitive interface for Checkmate's Find and Sell process. It was designed with speed in mind. Confirm in a glance that your customer is in good standing, thanks to the "thumbs up" icon on the search screen. Find and sell an unlimited number of parts at one time. See part images alongside your search results. Navigate through your workflow with your mouse or with your keyboard - however you feel comfortable. The traditional version of Checkmate is still available, now it's called Checkmate Retro. You can even have Checkmate Retro and Checkmate Sales Pro at work on the same machine! Each user can use Checkmate the way they like best. Checkmate Retro is a character-based system, which means you type the commands with your keyboard instead of using your mouse. Many recyclers prefer this method! Checkmate Workstation gives you access to many Checkmate and Car-Part tools from within one program, and these tools help you increase sales and improve your business's efficiency. Checkmate Workstation is free with Internet Checkmate, but some of the tools require an additional charge. The Checkmate Workstation Dashboard gives you a real-time overview of your business, with up to 24 "gadgets" that display charts and graphs with essential information about sales, inventory, employees, and more. These gadgets can calculate your business information for today, a day in the past, or for a specific time span. Click to learn more. Dashboard provides you with real-time information regarding employees, inventory, sales, and more. 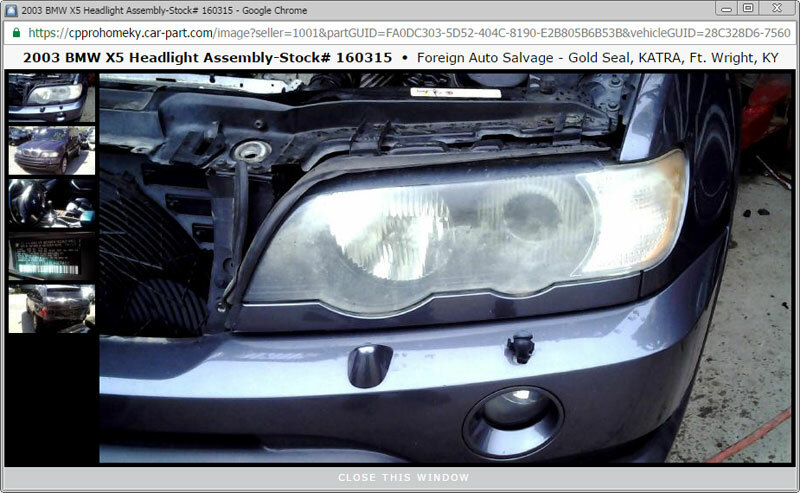 Checkmate Imaging allows you to easily add images to your parts and vehicles. These images can then be viewed in Checkmate or uploaded online to Car-Part.com, Car-Part Pro, Trading Partners, your own website, and eBay. When you can see a picture of a part or vehicle, you can make more informed decisions when deciding between similar parts. Imaging increases employee productivity by enabling them to more accurately select which part to pull. Click to learn more. Adding images to parts and vehicles is as simple as clicking and dragging an image to the part information screen in Checkmate. Imaging is free with Internet Checkmate! 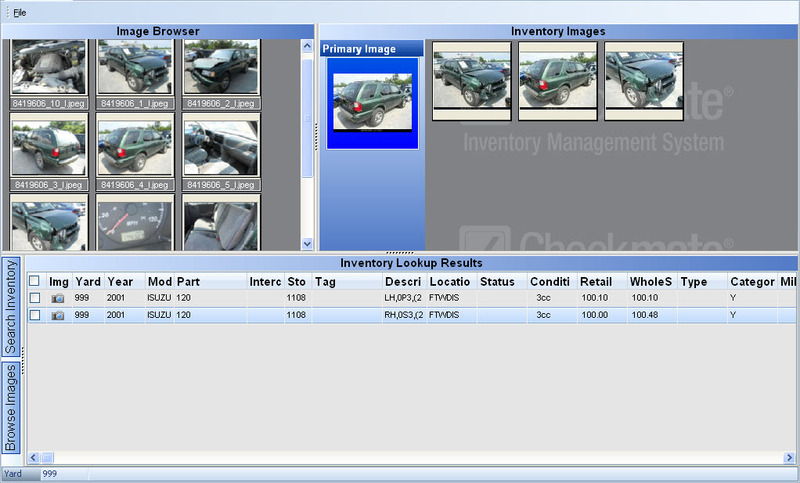 Adding images in Checkmate and uploading them to Car-Part search results gives you an incredible edge with shops and appraisers. Members of the collision repair industry constantly tell us how vital detailed information is when they are searching for recycled parts, and photos are exactly the kind of information they look for when shopping online and deciding which part to purchase. The thumbnail in the Description is the image you set as the Primary part image in Checkmate or Partmate. (If a Primary image is not set, an image will be randomly selected for the thumbnail.) Your customer clicks that thumbnail to open a gallery window, which displays all public images associated with this part and vehicle (AUT). Don't worry – if you have images you don't want to be public, just mark them as Private in Partmate or Checkmate, and they won't ever be displayed online. Our Checkmate Listing Manager for eBay tool allows you to list many parts on eBay at once, with just the click of a button. eBay gives you the opportunity to sell parts that may not sell frequently in your yard. It's fast and easy because our eBay tool automatically pulls detailed information and images from Checkmate and creates the listing for you! Click to learn more. Checkmate and eBay are always in sync, so you don't have to be concerned about selling the same part twice. The parts you sell in your yard will automatically be removed from eBay, and the parts you sell on eBay will be marked as such in your Checkmate system. When parts are inventoried with interchange numbers in Checkmate, your eBay listings take advantage of eBay fitment. 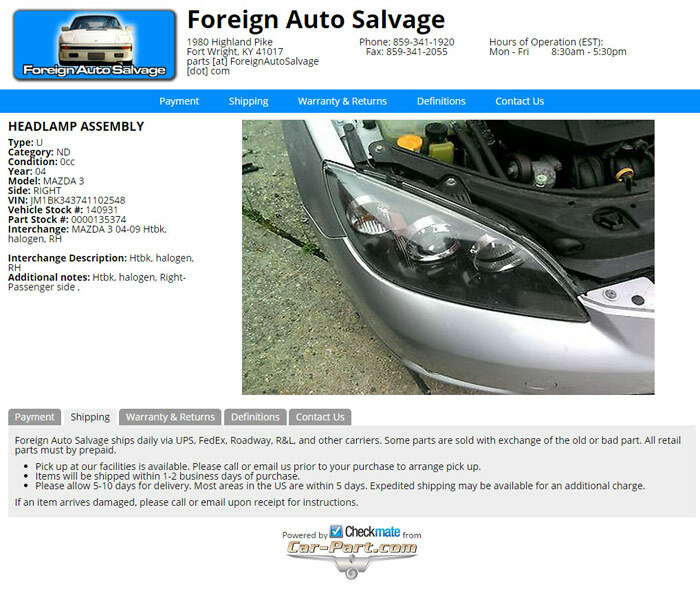 eBay's fitment is similar to interchange - our eBay tool translates these interchange numbers (including those for Car-Part Interchange Plus parts) to eBay fitment, making it easier for your customers to find the parts you are selling. The images that are included in your listings are uploaded from Checkmate Imaging, and you have control over which images are included. The primary image you set in Checkmate Imaging will be used as the primary image on an eBay listing. You can even use photos that you host remotely. If you have a photo you don't want to go public, just mark it as Private in Checkmate Imaging and it will not be uploaded to eBay. One of this tool's biggest strengths is its editing capabilities. Within Checkmate Workstation, you can modify listings before they are uploaded - individually, or as a group. You can even edit listings that are already live and active. Checkmate Listing Manager for eBay offers customization throughout the process of listing parts, and it puts you in control of what your customers see. This tool can help you improve your sales and establish a professional presence in the eBay marketplace. The Accounting feature in Checkmate provides you with the ability to look up customer accounts and retrieve invoices. With this feature, you can also make payments and issue credits towards those customers. Click to learn more. Look up a customer, and view their account number, current balance, and invoices. Access customer details, and make sure their billing information is up-to-date. Easily view remaining balances, document types, and more on the grid that displays after looking up a customer. Checkmate Reports dramatically increase your ability to access all data that is stored in your Checkmate inventory management system. These reports allow you to view your business in a comprehensive way that helps you make better business decisions and manage more effectively. Click to learn more. Our reports also include a Business Checkup report, which analyzes the health of your entire business. Take your profits to the next level! Advanced Management Reports is an upgrade to the standard Checkmate Reports (the upgrade is free for ICM Classic users). These are additional reports that help you unlock even more enhanced information to enable you to streamline your business, get the most out of your market and advertising dollar, and structure your buying to take full advantage of market demand. Click to learn more. Easily open these other valuable Car-Part Products from or within Checkmate Workstation! Click to learn more. CrashLink - While selling, inventorying, or pricing a part, access OEM-based interchange and pricing information with just a click! Bidmate - Our salvage buying tool, which calculates a vehicle's worth to your business and how well it will return your investment, so you know how much to bid at the auction. Advanced Bidmate incorporates Car-Part.com search data in your Vehicle Evaluation process, giving you valuable information for vehicles you've never had in inventory before. And when you win a vehicle, the information is sent straight to Partmate. Partmate - Our incredibly portable inventory tool makes the process of inventorying new vehicles quicker, easier, and simpler than ever before. Partmate expedites your workflow by connecting directly with Checkmate and Bidmate. Order Trakker - Keep track of your work orders from sales to delivery. You can track invoices from the time of the order until the part is delivered, and you will always know where the parts are and who has worked on the orders. 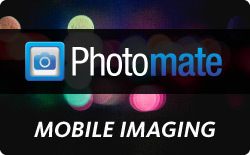 Photomate - With this mobile app, you have the ability to identify pieces of your inventory in Checkmate that require pictures and send them to Photomate to be imaged. You can assign parts to specific yard employees, who will be responsible for taking photos of their assigned parts. Once the photos have been taken, and sent back to Checkmate, Checkmate will upload these images to their online listings in its next scheduled inventory upload. UPS Worldship simplifies shipping for recyclers with high-volume shipping needs. WorldShip gives access to the complete range of UPS services, and streamlines your processes by connecting to Order Trakker, accounting systems, process packaging, and freight shipments, as well as displaying negotiated rates and tracking your shipments with email notifications. EZ Route imports and plans your deliveries from Checkmate, telling you the most efficient way to make your deliveries. (EZ-Route software is not created by Car-Part.com. Visit the EZ-Route website to learn more about it.) It tracks your drivers' progress throughout the day to make sure they are delivering according to plan. You can tell your customers when to expect a delivery, and your driver can get turn-by-turn directions on a tablet. Calculate your delivery sales, save fuel costs, see your drivers' status in real time (and let your customers know when to expect a delivery), and more! Car-Part Exchange is a parts-locating solution internal to Checkmate, which means you never have to leave your Checkmate program to find the parts you need. Car-Part Exchange provides you with immediate access to the inventories of the yards you frequently do business with. Real Time Barcoding works with Checkmate to wirelessly scan and move your parts to different locations at your salvage yard, and to audit those parts to ensure the most accurate inventory at all times. You can generate reports to show which parts have been scanned, which were moved, who moved them, and what parts are missing from your inventory. The Recycler Executive Roundtables are peer support groups that provide a forum for participants to share ideas and solve common problems in a confidential environment. 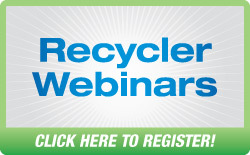 These groups, facilitated by Car-Part, help you share ideas and solve common problems with non-competing recycling facility managers and owners. Car-Part Interchange Plus is an interchange enhancement option that provides interchange for many additional part types that did not previously have interchange, like rocker moulding and glove boxes. Car-Part Interchange Plus helps you accurately inventory these parts, and makes them easier to sell. You can be sure you are inventorying these miscellaneous parts correctly – and with the Car-Part Interchange Plus integration with Car-Part Pro, your collision repair customers will appreciate knowing that you have exactly the part they need. Car-Part Interchange Plus is available exclusively to Checkmate customers, and integrates with several other Car-Part products.